It was a counter-reformation movement that fundamentally influenced the development of the literary production in Slovakia in the 17th and 18th centuries. Its centre became the town of Trnava with its Jesuit University and printing company. Latin ceased to be an artistic language, however it kept its dominant position within the genre of scientific literature until the end of the 18th century. National language (Slovakised Czech and Cultural Western Slovak) asserted itself as a means of expression of Catholic religious literature in prose and in verse. Anti-Reformation efforts resulted in Slovak Protestants associating themselves with the standard Czech used in the Kralice Bible, which became the symbol of their spiritual existence, moral persistence and loyalty to their own religious beliefs. Despite the controversial relationship between the two denominationally-distinct parts of the Slovak intelligentsia, the spread of the national language began to create the preconditions for a future supra-denominational principle of unification of the Slovak national movement. The dominant literary work was religious poetry, which had been spread among the people via hymn books. The Evangelical Lutheran hymnal Cithara Sanctorum (Lyre of the Saints, 1636), written by Czech exile Juraj Tranovský, became the best-selling book in Slovakia. Other authors of religious lyrical poetry included Sinapius Horčička, Samuel Hruškovic, Daniel Krman, Adam Plintovic, Juraj Zábojník and Joachim Kalinka. Evangelic spiritual poetry and the Catholic hymnal Cantus catholici (1655), written by Benedikt Szőllősi, had some motifs in common such as the transience of worldly things and death as a symbol of the futility of all human endeavours. Folk and semi-folk literary works were represented by an informal literary production which had a marginal impact on literary development. The only non-anonymous composition by Štefan Ferdinand Selecký called Obraz pani krásnej perem malovaný (Portrait of a Beautiful Lady Painted with a Feather) was written in heavily-Slovakised Czech. This poem composition, which made use of the elements of court lyrical poetry such as petrarchism and allegorism, took the form of an idealised allegorical description of Trnava University. 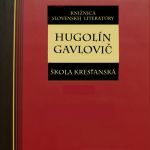 The peak of the baroque literary output was marked by the didactic poems Valaská škola (The Sheperd’s School, 1755) and Škola kresťanská (The Christian School, 1758), written by Franciscan Hugolín Gavlovic. Baroque prose (memoirs and travel books) reacted mainly to the events of war and the religious persecution of Protestants. The literary work of Ján Simonides, Daniel Krman, Stefan Pilárik, Tobiás Masník, Juraj Láni, Samuel Hruskovic and Joachim Kalinka was attractive, not only because of the way in which it recorded historical events and travel impressions, but also due to the literary quality of the author’s coming to terms with the religious and moral dimension of human life. Baroque poetry (tragicality, a conflict between power and individual morality, self-sacrifice etc) was also applied in Jesuit school games by Protestant author Elias Ladivera. Thanks to the incentives of European thought (rationalism, empiricism), interest in historical and philological studies increased in Slovakia, as proven mainly through the scientific works of Ján Baltazár Magin, Matej Bel, Samuel Timon, Adam Frantisek Kollár and Pavol Valaský.